Home/Decision Makers/Decision Maker Tutorials/Determine if a Sound Affects a Marine Animal Tutorial Introduction/Tutorial: Where are marine animals likely to be located relative to the source? To determine where are marine animals likely to be located relative to a sound source, scientists consider how the animals are spread throughout the area. The first question is whether or not a particular species is found in the area at the time of year that the source is being used. For species that might be in the area, the important factors to consider are their distribution patterns (for example, are they found close to shore, far out at sea, near seamounts? ), their density or abundance (how many of them might be in the area? ), their swim speed (how fast would they be moving compared to the source? ), their movement patterns (do they swim in a straight line, or are they milling around? ), and their dive patterns (how much time do they spend at the surface, what depths do they dive to and for how long?). The answers to these questions give a picture of how the animals are distributed throughout the area. Scientists cannot predict precisely where individual animals will be located; therefore they make estimates of the likelihood that animals will be in certain locations. Humpback whale distribution. The blue dots show where humpback whales were sighted near Kauai, Hawaii during January – April 2001. The inner and outer lines around Kauai show where the water is 100 fathoms (600 feet or 183 meters) and 1000 fathoms (6000 feet or 1830 meters) deep, respectively. The humpback whales were often sighted in nearshore water, less than 100 fathoms deep. The red dot north of Kauai shows where the ATOC/NPAL source is located. 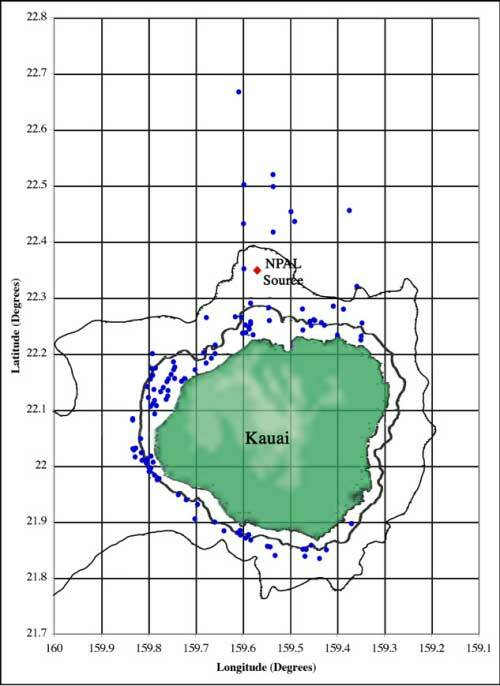 Distribution of humpback whales sighted near Kauai, Hawaii during January – April 2001 are shown below. The illustration shows that humpback whales largely prefer to be in nearshore water that is less than 100 fathoms deep.